The Wheel Hoe Junior is our Single Wheel Hoe with shorter handles to accommodate the woman or youth gardener. Made in the USA with powder-coated steel and Amish-crafted, hardwood handles. Upgrade Your Package with Our Wheel Hoe Success Kit! Only $19.99! The Wheel Hoe Junior is our version of the ultimate garden tool that has shorter handles to accommodate women or youth who like to grow their own food. A Wheel Hoe is the perfect tool to maintain a small vegetable garden. It requires no fuel to operate and you won’t ever have to worry about the tires going flat. A Wheel Hoe allows you to perform frequent, shallow cultivation to control weeds and perform a variety of other tasks with our selection of Wheel Hoe Attachments. A Wheel Hoe requires a much narrower row spacing than a tractor or a motorized tiller. This means you can utilize your garden space more effectively because it allows you to plant rows closer to each other and you can grow more with less room. Each Wheel Hoe Junior has a frame made of powder-coated steel, a 15” wheel and Amish-crafted, hardwood handles. The 1/4″ thick steel tool bar is designed so you can attach our wide variety of Wheel Hoe Attachments for weeding, making furrows or hilling beds, or planting your seeds. Our Wheel Hoe Success Kit includes everything you need to maintain your Wheel Hoe, change attachments and keep your blades sharpened. 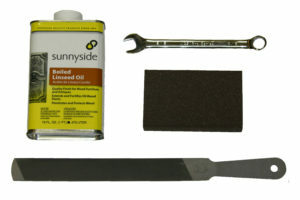 The Wheel Hoe Success Kit includes Boiled Linseed Oil for conditioning and protecting your Wheel Hoe handles, a 9/16″ Wrench for changing Wheel Hoe attachments, a Farmers File for sharpening attachments, and a medium grit Sanding Block for polishing and smoothing any rough spots that may develop.